Will Interactive Ad Storefronts Take Off? Home Ecommerce Platform Will Interactive Ad Storefronts Take Off? 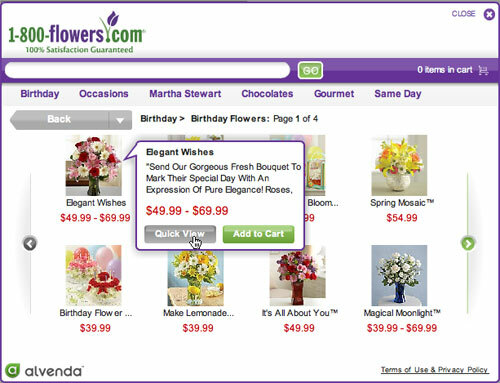 1800flowers recently launched an interactive shopping widget with a product developed by Alvenda. The widget allows a fully functioning storefront to appear in ad units on other websites. Shoppers can browse and purchase through the unit without leaving the web page they’re looking at. You can play around with the demo here. At first blush, I didn’t think browsing within the smaller window would be usable. Wouldn’t a larger screen make the shopping experience more pleasant? Why does everyone think customers would rather jump off a cliff than click an extra button? But as I played around with the widget, its AJAX-y goodness actually felt more usable than a traditional site. I didn’t have to scroll up and down the page to view products or click to load another page. I could scroll within the widget, hover over thumbnails to see more information, and see a quick view without a new page load (saves time). I started to dig it. The size also had the feel of a mobile application – something designed specifically for a smaller viewing area. Shopping widgets have a lot of potential for mobile applications, Internet enabled television, gaming consoles and other electronic devices that access the ‘Net. Pushing your storefront anywhere there’s a screen is the next step in multichannel retailing. Stay tuned for the recap of today’s Webinar Multichannel 2.0: Are you ready for the next generation of commerce channels? hitting your Inbox or RSS reader Friday.